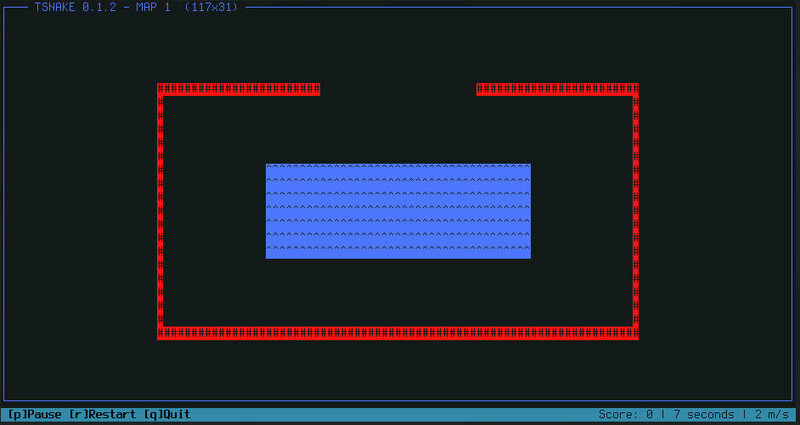 The project I’m sharing today is tsnake, a terminal-based snake game which supports maps, different difficulties, and interactive resizing, all rendered in a terminal window using ncurses. The first thing we do when starting a new game is creating the game window. To do so, we use the newwin(nlines, ncols, y, x) ncurses call. This returns a WINDOW type object, which we keep in the game state structure, along with its width and height as cols and lines. The window has a size of [LINES-1, COLS], leaving the last line for the status bar, where we print some useful information like the key bindings, the current score or the speed of the snake. Here is a sketch of what this very simple setup looks like. Then we draw the map identified by the given id and after that we start the actual game loop. In the following sections we will mostly use the function variants which take in a window as one of the arguments. These functions contain a w somewhere in the name, and are counterparts to the ones without w, which act on the default canvas. For example, mvinch(y, x) gets the character at a given position in the main canvas, while mvwinch(*win, y, x) gets the character at a given position of a given window. The code snippet that follows draws the initial map, which contains a pool with a fence surrounding it. Let’s break it down a little. The variable state holds the game state, and contains the game windoe (gamew), the window width and height (gw_w and gw_h), the current score, the snake position and a few more pieces of information. In this snippet, we use wattroff(*win, attr) and wattron(*win, attr) to control the colors with which the characters will be printed. We use defines to link color location integers with meaningful names like C_WATER (blue) or C_WALL (red). Then, we can use mvwhline(*win, y, x, char, num) and/or mvwvline(*win, y, x, char, num) to create vertical and horizontal lines of length num starting at [x, y] with the character char in the window win. We also use defines for the character types. In this spirit, water tiles are #define WATER '^' and the walls are #define WALL '#'. With all this, building the maps is just a matter of putting the right tiles at the right places. We only ever draw the map in two situations: when the game starts and when the window is resized. We will query the window state with char mvwinch(*win, y, x), which returns the character at a given position in a window. The first map of tsnake, a simple pool surrounded by a few walls. Once we have printed the map, we start with the main loop. The main loop manages the resize events (even though they are not really events), manages the input and updates the state. In order to support terminal resizing, we need to check whether the variables COLS and LINES have changed. If so, we redraw the map, reposition the snake and the food using interpolation and refresh the window. Then, we use getch() to get input keys. Usually, this function blocks the program until a new character is received. There are obviously many more aspects to the implementation of tsnake which have not been presented here. This article only gives a very rough bird’s eye view on how to use ncurses and the possibilities that the library offers. Feel free to check the full source code in the gitlab repository. You can install the tsnake aur package if you are on Arch or derivatives.